There is something special about an ocean town off-season, the streets are less crowded and there is a sense of calm as if nature knows there is a shift coming. I went to Rockport, Massachusetts for the first time last September and look forward to making it an annual tradition. I wanted to point out some of my favorite spots for the enjoyment of our readers (and so that I will remember them for next year hehe). The most famous landmark in Rockport is Motif Number 1. This fishing shack in the harbor is the most painted building in America. It is a quintessential icon of the New England seaside and attracts artists from all over the world. Jetty Walk Arts- We walked into the shop after hearing worship music playing from the street. The shop owners are the sweetest people and have a lovely collection of unique sea glass jewelry. My Place by the Sea- I have never actually eaten here, but it's on my list. The location near the water and the twinkle lit patio make the restaurant look divine. Rockport Fudgery- Walking in Rockport while eating fudge, it's a thing. The Ice Cream Store- Take your ice cream out back on the lawn chairs for an ocean view. Ray Moore's Fish Shack - As a born and raised New Englander I know a thing or two about lobster. And I MUST say here lies one of the best lobster rolls I have ever had. Bean & Leaf Cafe - For a yummy coffee and pastry pick me up after a day on your feet. Shalin Liu Performance Center - If you have a full day, check out a music performance at this stunning venue. My friend and I were caught sneaking a peek through the windows when the desk attendant waved us in. She let us take a tour of the concert hall with floor to ceiling ocean views. At the top of the street there is an overlook and a rock path that extents out over the water. People enjoy walking over the rocks and taking in the view. There is usually live music to serenade the onlookers. I adore the seeing mums and wild sea flowers popping up all over town. Let us know if you have any Rockport recommendations! With the close of Labor Day Weekend, we couldn't wait to visit some local New England farms to get in the spirit of fall. We stopped at Bolton Spring Farms for our fill of cider donuts, checked out Derby Ridge Farm to see all things pumpkin and then toured Apple Field Farm to get creative. Apple Field Farm has an adorable section where you can choose from the best fixins to create your own little dried flower bouquets. We whipped out our phones with our fresh fall-color cases from Case Station USA and had a blast taking in all the delights of the season. Case Station USA allows you to create custom cases or you can choose from their featured designs. One of their September collections particularly caught our eye. This month is childhood cancer awareness and purchases from Case Station USA's Gold in September collection go directly to childhood cancer research. You still have a couple weeks to shop the collection! The designs are beautiful and support a great cause. Ruthie chose the Bee Happy design from their collection - the design is perfect for the start of fall! Becky's case is from the Meghann Rader collection and is one of our favorite seasonal colors. Our outing made for the best weekend and we're so excited to enjoy the fall season with all it holds. What are some of your favorite fall activities? Any of you out there planners? I certainly am, which is why I had to know the gender of my baby before they (singular) were born. I had this sixth sense that I was having a boy... leading me to believe it was probably a girl. Anyways, I didn't know if I wanted a gender reveal party but figured for my first baby, it would be fun. I repurposed a lot of my old wedding decor that I've been using as home decor (I love recycling!) and also did a few DIY's. I have to say the big reveal was a blast! So, was I right about my baby being a boy? Scroll through the images to find out! Shoutout to my brother and sister in-law for photos! 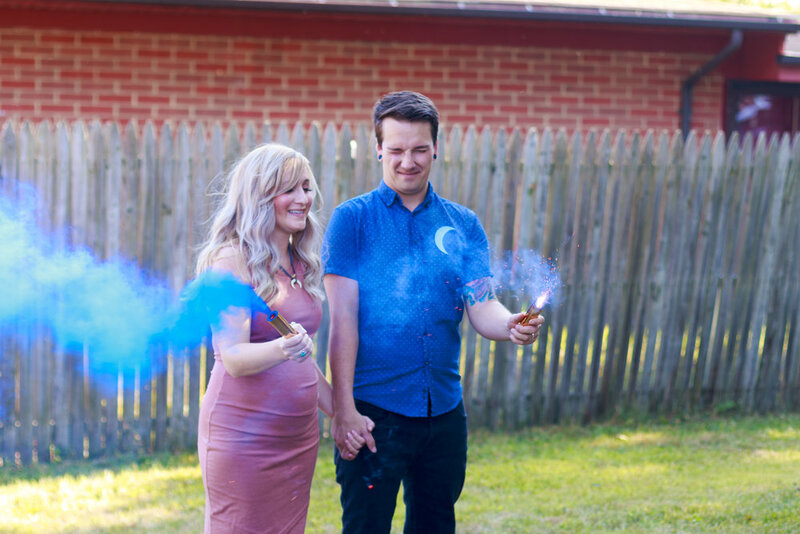 We decided to use smoke bombs to reveal the gender - I bought two of each color and Ruthie came to the party early to read the results and cover the correct smoke bombs in gold washi tape. She then was the sole proprietor of my baby's gender. Much thanks to Ruthie for holding in the biggest secret for hours while everyone, including myself, were guessing the gender of my baby. She's the best sis in the world! As I write, a crisp breeze settles into the summer night, a reminder that August is winding down. Families are heading off on their last vacation, and kids are back to school shopping. Summer is a peaceful time for most people, life seems to halt for two months of sunny bliss and beach filled weekends. But when September comes, so does the rat race! I want to share some tips to keep in mind when things get busy. To develop a peaceful mindset in our hectic culture takes intentionality. “They are opening the first Starbucks in Milan this year.” My friend somberly stated as we chatted about our time in Italy. A culture that takes so much pride in their coffee will now be rocked by a world of to-go cups and entitled customers. My hope is that this will not be the case, one of the things I appreciated most about the country was their ability to find the hush in the hustle. Restaurants never asked if you were ready for the check, because they didn't want to interrupt a relaxing time with friends and family. It really helped me to reflect on the importance of being present, and treasuring time spent with loved ones no matter how busy life gets. Maybe this means you choose not to go out on Friday night. Maybe your plans are literally Netflix and ice cream. For an extroverted introvert such as myself, it can be hard to turn down a fun event but we can't forget to have downtime. It give us time to recharge. I usually look at my weekend and set aside either a night or morning of rest. This sets the tone for my week. Consider coming off Facebook during busy seasons. Sometimes I'll deactivate for a month and it's the best thing ever. Social media may seem like a good way to zone out but scrolling through an endless feed can open up the door to life comparison and allowing ourselves to get consumed with negative news. Some alternatives: read a book for leisure, listen to a good podcast, or go on a nature walk. There are times when it's hard to reach a place of peace because of turmoil happening around us. In this time I am reminded of Matt. 11:28, "Come to me, all who are weary and burdened, and I will give you rest." We were never meant to bear the weight of the world on our shoulders, but there is One who did for us. Spending time in worship and prayer centers our heart around what truly matters. There are ways to find cheap flights to Europe, the most obvious way is to go off-season. I traveled in the winter to Italy and Becky traveled in the early spring to Amsterdam on our recent ventures. Both flights were under 600! My AirBnB host told me that his apartment is always open in the winter but books solid through the summer. It might be a little chilly if you go in the colder seasons, but if you're use to the harsh New England winters then it will feel like spring. Also, when you travel this time of year there are less tourists, and you will have the opportunity to experience more of the authentic culture with the locals. In the United States, we get frustrated waiting for that person in line to count out their exact change for the cashier. Come on, just hand them a 20 already. However, in European countries you are causing frustration if you try to hand the casher a large denomination. I got the stink eye one too many times for not having exact euros for my purchases. One shop owner had to go to a store across the street to see if she could get me change, and when I tried to pay for chocolate with 20 euro at the airport it was declined. The moral of this tip is to collect as much change as you can and keep your bills small if you want good shopping relations. I was told by many well-traveled sources that comfortable walking shoes are a must in Europe. I took a trip to the mall per my hair stylists recommendation. She told me about store called, The Walking Company. I previously never knew about this store or any store for that matter that created stylish walking shoes. I took the recommendation and much to my surprise I found a very comfortable pair of booties by Rockport. When I arrived in Italy I was not disappointed with my purchase. The roads are beautiful and historic cobblestone, not smoothly paved like back home. "Why would bring my charger? My battery is 100% charged and ready for the day!" Nope. Your full charge cannot compensate for all the photos you take, the times you get lost and need google maps, or when you're scrolling through your phone on an hour long train ride to Rome. Many of the trains and cafes have outlets so charge when you can. I know this goes against the recent advice warning that charging in public ports is dangerous but, pics or it didn't happen. 5. But What Shall I Wear? Glad you asked. The key to style for many Europeans is neutrals and they dress well, always. Everyone I walked past managed to get up and walk the streets on fleek. Black, white, beige, and gray are your best friends in the winter and a scarf almost year round. When the weather warms, you will see more pops of color, but you can never go wrong with a classic basic. I picked up some shirts from Madewell and a beige peacoat at Top Shop. If you want to look trendy, neutrals can do the trick. It's fun to blend in, but also good for safety as the sports sweatshirt wearing, fanny pack toting, sneaker enthusiasts of America are a target for pick pocketers. Along those lines, make sure to bring a purse that zips. When first arriving in Italy I had planned on taking the bus to our AirBnb and then using buses throughout the trip. I never actually ended up using a bus. After a long day of travel with heavy luggage, a taxi was the perfect hassle free choice from the airport. When we needed a taxi back to the airport the local service was only a Skype call away. Many of the cities are "walking cities" so when traveling locally take advantage of all the exercise. For a big day trip, European trains are the way to go. They are clean, well run, and fast in my experience. Generally you can buy tickets right at the station, but if you're traveling on a weekend it's best to check availability online. I used the site "Go Euro" to purchase tickets. We went "off-season" so naturally one would assume that it would be easy to get into museums and hop on a train to a popular city. Although we were able to get into the Uffizi Museum and see the famous Statue of David, it involved waiting in line for two hours in the chill of the morning. Next time I will surely be a part of the line that already has tickets. On that note, the night before heading to Venice I went online to buy my train ticket and much to my dismay the morning trips were booked. The prices kept rising every time I refreshed the page, little did I know it was carnival time in the city. Lesson learned. This might not come as an utter shock, but Europeans eat much better than we do. The food is overall healthier and tastes better as they take great pride in food preparation. If a region has a unique food like "wild boar", give it a try! I must admit this was a regret of mine as I stuck to more traditional Italian foods aka: pizza and pasta. And lets not forget about the coffee, I'm sure it's similar all over Europe, but Italians make coffee 10x better than the average coffee in the states. They invented the cappuccino after all. However, the amount of caffeine was not enough to sustain my ability to function. Double expressio is the way to go. This tip is more practical, if you plan on curling your hair and charging your phone, you'll need a converter for European power outlets. I bought the "All-In-One" converter from Best Buy. I was happy to see that our AirBnb had a hair dryer so we wouldn't have to worry about blowing a fuse. No one wants to be that person. As much as you prepare and research, not everything will go as planned. Travel is about adventure and sometimes adventures develop in the moment! We never planned to drive up to the hillside of Tuscany with a stranger because there were no taxi's or stumble upon the Piazzale Michelangelo at sunset. There might be bumps in the road or little blessings along the way, but it will all lead to memories that last a lifetime. Happy Travels! Please feel free to comment or share any tips you have from your journey abroad! As the days get warmer, there's nothing quite like a refreshing cool glass of water. And what better way to quench your thirst than to spice up your ice with some bright florals? That's what we did as a special Memorial Day Weekend DIY. We chose an array of tropical petals, but this weekend you could add red, white and blue pansies to wow any BBQ guests. Color coordinate your flowers for any hosting occasion! When I booked my flight to Amsterdam, I was thinking only of how excited I was to score cheap airfare. I didn't check the details until after booking. It came as quite a surprise when I noticed my flight included an 11 hour layover in Heathrow Airport. But, when life gives you limes, you buy tequila. So when life gave me an 11 hour layover in London, I made a mini vaca out of it. 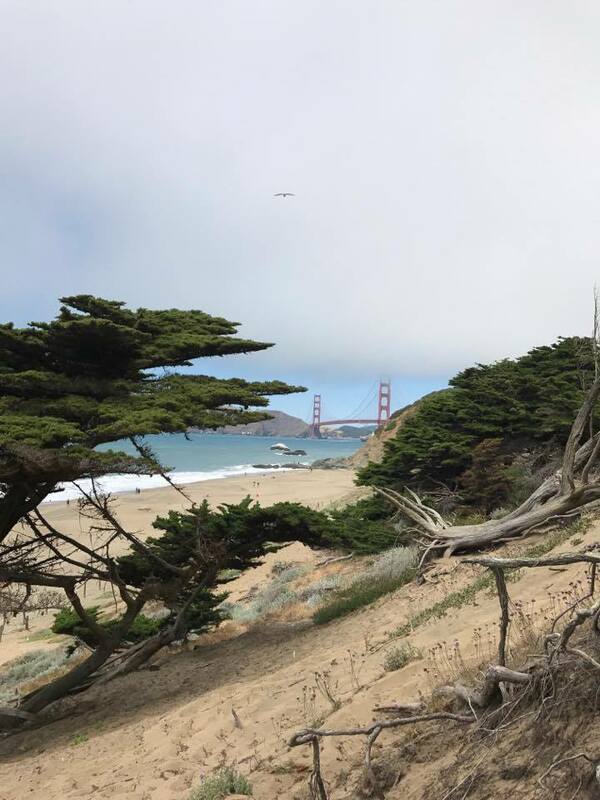 I wanted to share a few tips along with the details of my trip in case anyone else wants to make the most of their long layover! After a joyous flight of reading and watching two great movies -- Passengers and The Magnificent 8 -- I landed in Heathrow and found the express train to London, which dropped me off at Paddington Station. Even though I initially planned to map out my journey ahead of time, it didn't end up happening and my trek went wayward for the first 15 minutes. It all turned around when a kind stranger gave me their Oyster card (they were done with it for the night). An Oyster card gets you anywhere you need to go in London. Once I received the Oyster card, I mapped out my journey on Google Maps and saw my trip go from zero to 80 in five seconds! If I made a plan before I landed, it would have made a world of difference. Learn from my mistakes! My first stop was Baker Street, because Sherlock. I suddenly felt like I'd been transported to a different time. It was quite exciting. From there, I got back on the tube and stopped at Westminster to see Big Ben. It was essentially the one thing I was determined to see on my layover. That and fish and chips, which I didn't end up having. At Big Ben, I made friends with another solo traveler and we decided to go to a few milestone spots together. I was thankful for this because I didn't know where to go after Big Ben. We walked over to the London Eye and on the way I saw the quintessential red telephone booth. Of course, I snapped some photos before walking over the Westminster Bridge where someone was playing the violin, my favorite instrument. It was at this moment that I decided I liked London. I never really desired to visit London before that moment but now I definitely think it's worth a journey back! After the Westminster Bridge, we walked to get some Indian food and then found China Town. It was so charming there. We also stopped at Piccadilly Circus. It was absolutely stunning at night! The double decker buses zoomed by and I loved every second there. Once I felt successfully tired, I hopped on a double decker bus and got to the hotel I booked next to the airport. This hotel was $35 and I found it on Expedia. Sounds sketchy, but it was actually nice for what it was. I showered, slept for a couple hours and then used Google Maps to find the nearest train stop to Heathrow. It was an easy walk and I purchased another Oyster card. I couldn't believe how much I lived in a short 11 hours. You can turn a layover into an exciting adventure! I felt so accomplished for venturing out by myself. It was exhilarating. Once I successfully sat down on my plane to Amsterdam, I knew I had been successful in my mission. I got some shut eye and then landed for my next adventure. You can read all about my journey to Amsterdam here. Mother's Day is just two Sundays away and we thought, what better way to bless our moms than to give them a gift that gives back? We compiled a list of 10 amazing companies that are near and dear to our hearts. We hope you enjoy and find some inspiration for mom this year! At Thrive Where Planted, Earth Day is our favorite. It's the best day to get out in nature and enjoy the beauty this earth brings us. To commemorate this wonderful holiday, we wanted to share some of our favorite places to buy plants. What are your favorite things to do on Earth Day?